If you have driven into Fort Calhoun lately, you’ll notice a few new soldiers standing on the north and south sides of town. 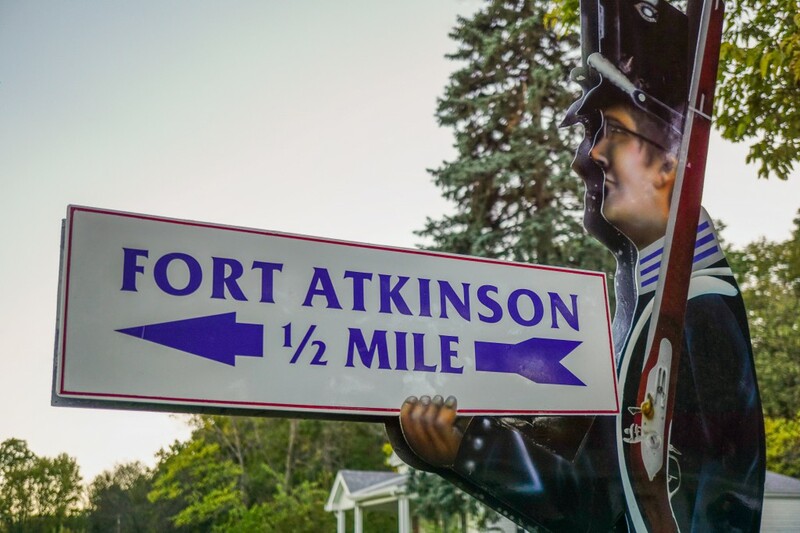 These soldiers, made of iron and painted to look 3-dimensional, are part of an effort to bring additional recognition to Fort Atkinson State Historical Park and help brand the area as a “fort” town. A plan was laid out that would involve the Commission, the Fort, the City of Fort Calhoun, and local businesses. The Commission provided $14,000 in grant funding, while the city provided assistance from its Keno funds. Local businesses were contracted for plasma-cutting, painting and moving dirt. Last winter, the city began working on meeting road requirements, and Black Dog Steel in Tekamah began the process of drawing and cutting the 9-foot tall iron statues. Once cut, artist Art Clausen brought the statues to life by airbrush. The soldier in front of the Wilkinson building on the south side of town was modeled after Steve Kemper, a previous and longtime park superintendent at Fort Atkinson. The soldier in front of the park resembles the Fort’s current superintendent, John Slader. Total, there are four 9-foot soldiers in town, all pointing to the park. The plan also calls for smaller 5-foot soldiers to line the streets in town. A new directional sign was also put in place on the east side of Highway 75 in the apple orchard belonging to the Super Bee Orchard. However, brickwork, landscaping and the welcome sign are still being completed. The project is made possibly by Linda Welsher at the city office, Black Dog Steel, Art Clausen, Tri-County Grading and volunteers. For more information, contact the Friends of Fort Atkinson.